The USGS gage on Lookout Creek at the HJ Andrews Experimental Forest. Photographed in 1952 by Don Wustenberg. Established in 1948 by the U.S. Forest Service, the H.J. Andrews Experimental Forest was originally designated the Blue River Experimental Forest. Horace Justin Andrews, US Forest Service Region 6 Chief Forester at the time, was a strong supporter of forest research and was directly involved in selecting the location of the Experimental Forest near the community of Blue River, Oregon. After Andrews' untimely 1951 death in an automobile accident in Washington, D.C., the Experimental Forest was renamed in his honor in 1953. 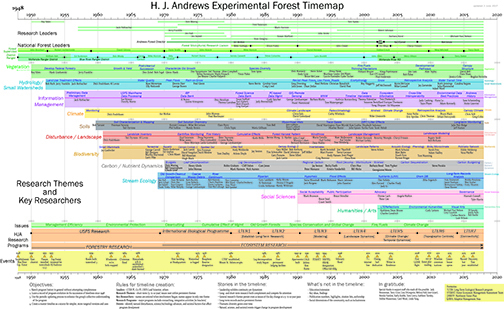 The overall history of the Andrews Forest is depicted in a timeline showing research and Willamette National Forest leaders, major research themes and associated researchers, shifting issues, major events, and keystone publications. Over the nearly seven decades since its inception, the Andrews Forest has witnessed a diverse and impactful research history, with major research foci changing over time. 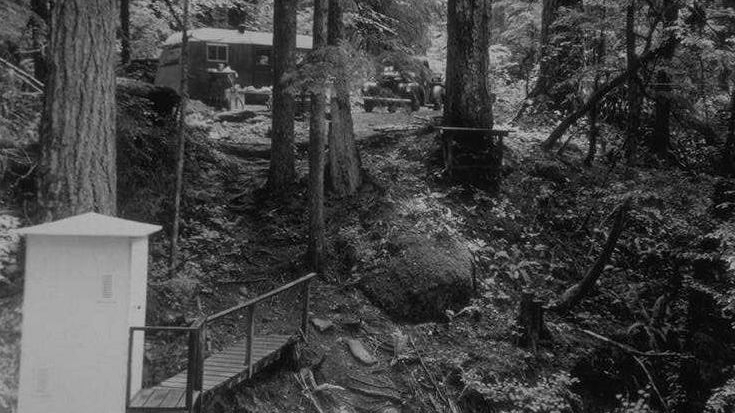 Efforts in the 1950s concentrated on increasing efficiency of forest operations, such as forest regeneration, road engineering, and logging systems appropriate for old-growth forests. Also, beginning in the 1950s, USFS scientists initiated three sets of experimental watersheds designed to study the effects of logging on hydrology, sediment yield, and nutrient losses. Treatments included clearcutting and partial cutting, and one watershed was left in its “natural” forested condition as a control. During the 1970s, with funding from the National Science Foundation (NSF), the International Biological Program (IBP) supported collaborative research to examine old-growth and managed forest and stream ecosystems. With IBP funding, a large, interdisciplinary team of academic researchers mainly from Oregon State University, joined USFS researchers to study nutrient fluxes, forest succession, disturbance ecology, the full diversity of plant and animal species, and many other topics. Establishment of a system of forest plots (reference stands) and many other programs of environmental monitoring were created during the decade which provided a foundation for long-term ecological research. In 1980 the Andrews Forest became a charter member of the NSF-sponsored Long-term Ecological Research (LTER) network. The LTER program supported the continuation of long-term studies and environmental monitoring (e.g., climate, streamflow, water quality, population dynamics of sentinel terrestrial and aquatic species, vegetation succession, and disturbance events). New long-term experiments were established under LTER, such as the monumental 200-year log decomposition study established in 1985. Since the 1990s, Andrews Forest scientists have developed landscape level studies, and have begun testing methods of ecosystem management. Connections with society intensified greatly in the late 1980s as earlier research on old-growth forests, northern spotted owls, and watersheds became central to ongoing political conflicts over the future of federal forested lands. Andrews Forest science and scientists played important roles in many land management and policy deliberations, and the long history of research-management collaboration with the Willamette National Forest was critical in helping formulate new approaches to forestry. Social scientists began working within the Andrews Forest program in this period, and early in the 2000s, creative writers, artists, and others from the humanities, became engaged with the Andrews Forest (see the Arts and Humanities section of this webpage). Presently, the major research themes at the Andrews Forest continue to include disturbance processes, landscape and water dynamics, carbon sequestration and fluxes, biological diversity, forest-stream interactions, spotted owl demography, soil and watershed processes, and the cultural dimensions of forests and watersheds. Long term data are also being examined for environmental trends over time in relation to climate, succession, and other factors. The history of the Andrews Forest, and, indeed, that of any long-term ecological research program such as any of the 25 LTER sites, has revealed important knowledge for society writ large, not just for the ecological sciences, and provoked questions about humankind’s relationship to the world. How did the Andrews Forest program come to have an important impact on change in society’s perception of old forests? How did researchers at Hubbard Brook Experimental Forest and LTER site in New Hampshire discover “acid rain” and have a major impact on federal legislation on air and water quality? Was this luck, or are there institutional factors that can maximize the payoffs of national investment in long-term ecological research? To address these questions, we embarked on a project to inventory, organize, and archive historical records of the Andrews Forest program, a project also designed to encourage history scholarship about development of the research, education, and outreach components of the program.